Royal Crown Derby has a long history of creating tableware that elevates any dining experience, providing understated elegance and luxury. 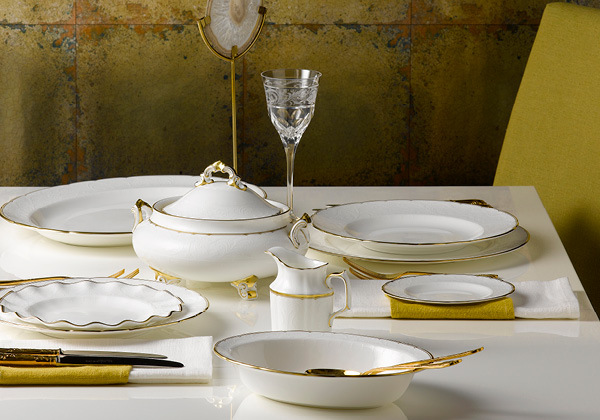 Nowhere is this seen more than in creating truly indulgent bridal tableware settings. Take a look at a special selection of fine bone china tableware, highlighting the three key bridal trends for 2018. Each one perfect to create a tablescape design that reflects the celebratory mood of any wedding or occasion. The Effervesce collection brings modern elegance to the wedding table setting by adding textural metallic embellishments, reflecting one of the most stylish trends of 2018. The collection features a playful textured-effect pattern offered in two stunning colourways, the cool and contemporary Pearl and sophisticated Aqua, representing the effervescent bubbles of a fine Champagne. 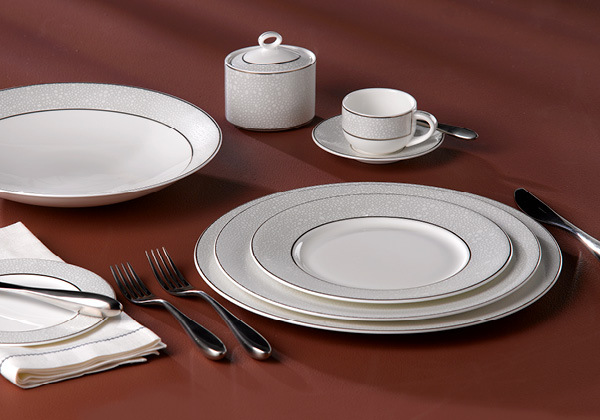 Each skilfully crafted piece of tableware is expertly finished in hand-applied platinum, adding a final touch of luxury. 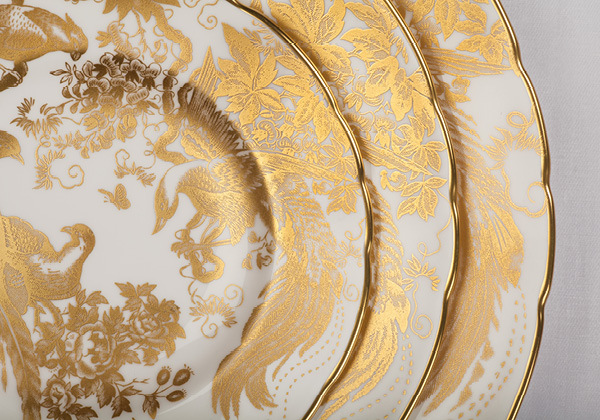 For those who prefer a more extravagant table setting for opulent indulgence, the Gold Aves collection is adorned with dramatic birds of paradise and peacocks with elegant, trailing feathers, lavishly hand applied in 22ct gold on a full border pattern. A perfect statement to any celebration. While formality remains important during special occasions such as weddings, a growing trend has been emerging which sees couple’s adding a contemporary twist to celebratory dining experiences to relax this formality by using casual luxury tableware. Royal Crown Derby’s Darley Abbey Pure tableware collection features a beautiful modern white-on-white interpretation of the renowned Darley Abbey archive pattern, perfect to bring a modern whimsical charm with a touch of heritage to the table. 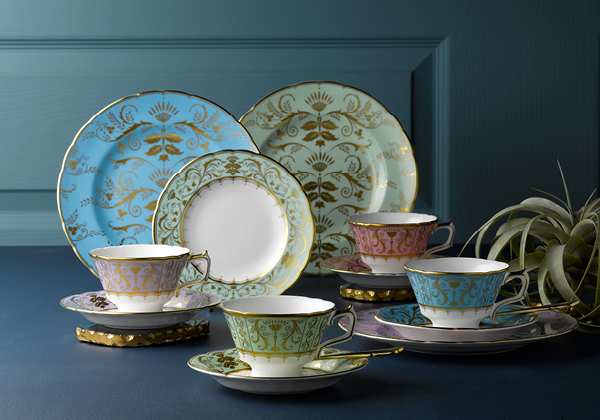 Offered in the finest of white bone china with either a 22 carat gold or platinum edge to accentuate the delicate lines of the damask border pattern representing the twirling foliage and filigree leaf design. View the Darley Abbey Pure collection here. Couples wishing to create a unqiue bridal table setting are no longer confined to using just one design. Texture need not come from just the design on each individual piece on a formal dining setting, it can be created through mixing complementary colours and designs. The contemporary and playful, Darley Abbey Harlequin design is a modern interpretation of the Regency-style simplicity of Royal Crown Derby’s classic Darley Abbey archive pattern. Darley Abbey Harlequin is available in pink, green, lavender and blue and is expertly hand-finished in 22-carat-gold. Each plate, teacup and saucer complements the soft green silk damask of the original collection or can playfully highlight the elegant ‘Pure’ collection creating a wonderfully modern bridal table setting. View the Darley Abbey Harlequin collection here. View the Darley Abbey collection here.